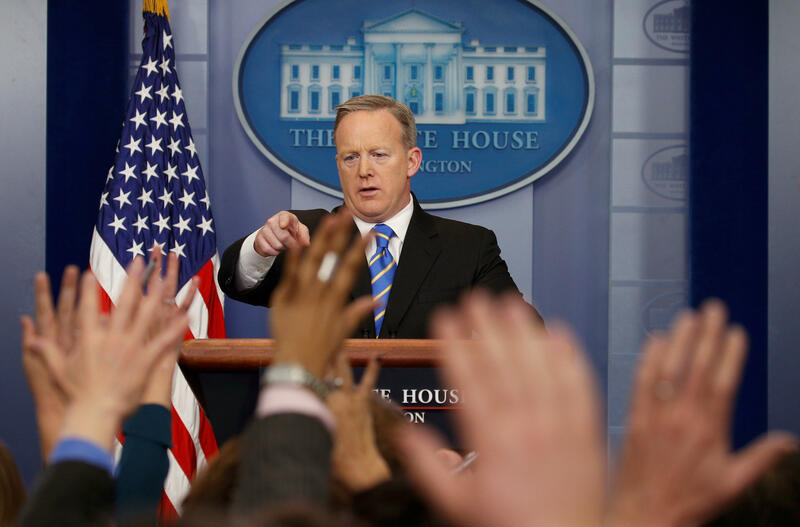 1:30 p.m. Spicer emphasized the president’s concerns when it comes to widespread voter fraud but still provides no evidence that millions voted illegally, as Mr. Trump continues to claim on social media. “We have to understand where the problem exists, how deeply it goes,” Spicer said, referring to the president’s call early Wednesday for a “major investigation” into unproven claims of mass voter fraud. 1:27 p.m. Following the president’s tweet late Tuesday about the violent crime in Chicago, Spicer took questions on the nature of the federal help he has offered to the city. On “sending in the Feds,” which Mr. Trump promised on Twitter, the press secretary said the president meant allocating federal resources via the U.S. Attorney’s office to Chicago to help combat crime. The White House, he said, will try to get a “dialogue” started with Chicago Mayor Rahm Emmanuel. Still, Spicer pushed back on reports that federal agencies have been directed to limit social media communications. 1:20 p.m. Pressed to weigh in on DACA -- President Obama’s Deferred Action for Childhood Arrivals -- Spicer said the president has yet to make a decision on the issue but that he is an understanding executive. The president will talk about it in an ABC News interview Wednesday night, Spicer promised, but the focus for deportations will be those who have committed crimes. Questioned on whether the president has whittled down his Supreme Court nominee choices, Spicer said he has not done so as far as he’s aware. 1:16 p.m. Asked about the draft memo on interrogation practices reported by CBS News and other outlets, Spicer pushed back on the media reports. Pressed on whether the president had asked for the document to be drafted in the first place, Spicer replied in the negative. “To the best of my knowledge, he hasn’t seen it,” Spicer later said. 1:10 p.m. Spicer says Mr. Trump will sign two executive orders Wednesday related to immigration after he witnesses the swearing-in ceremony of DHS Secretary Kelly John Kelly at the agency’s headquarters. The first will be on border security and improvements, which will direct the building of “a large physical barrier” along the southern border. Spicer later said that President Trump and Mexican President Enrique Peña Nieto will likely discuss the wall, as well as NAFTA, in their meeting next week. 1:05 p.m. Spicer gives an update on Mr. Trump’s pick for the Supreme Court, saying he will announce his final decision next Thursday. The press secretary also discussed president’s brief meeting Wednesday with U.S. ambassador to the United Nations, former South Carolina Gov. Nikki Haley. The briefing also comes just as Mr. Trump is expected to announce executive actions on immigration Wednesday during a visit to the Department of Homeland Security. Late Tuesday night, the president also sent a message on Twitter calling attention to the violent crime rate in Chicago. Mr. Trump promised that he “will send the Feds” to assist the city. Spicer will likely face questions about a draft of an executive order, obtained by CBS News Wednesday, which considers a review of how officials interrogate terror suspects. The draft also considers the possibility of reopening CIA-run “black site” prisons outside the U.S. Tune in to CBS News’ live stream on CBSN and live blog updates as it happens.